Crossgate at Remington homes for sale are set along private cul-de-sacs in a wonderful part of Simpsonville, South Carolina. 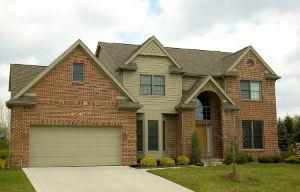 This is a newer community, where you still have the opportunity to choose your own home site. All Crossgate homes feature gourmet kitchens with granite countertops, James Hardie Color Plus exteriors (which includes a 15 year warranty), and high-end interior finishes. As for floor plans, there are several to choose from including sprawling ranches (no stairs), two-story and three-story layouts. Interested in learning more about what it's like living in Crossgate at Remington? Read more about community amenities or browse through our Crossgate at Remington MLS listings below. As a homeowner, you'll have access to a number of great community amenities. Crossgate at Remington real estate includes access to a heated community pool, a clubhouse for hosting events and maintained children's play area. The interior amenities of these properties have many 'head-turning' features as well. Open floor plans with elegant kitchens, bowed windows, recess lighting and hardwood floors are just some of the features that might pique your interest. If you're ready to take the next steps of buying or selling a home in Crossgate at Remington, be sure to contact RE/MAX Moves today. As a team of top Simpsonville real estate agents, we'd be happy to help you learn more about the area and make your next real estate transaction a great experience. Call (864) 520-1000 today.